Yokogawa released the world's first vortex flowmeter in 1968. Thanks to its long-term stability and high accuracy, our customers have achieved significant improvements in productivity over the past forty years. In response to ever changing market needs, Yokogawa has gone on to release high temperature, cryogenic, dual-sensor, reduced bore, and FOUNDATION Fieldbus communication versions of this product. 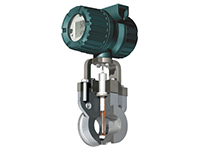 Yokogawa's forty+ years of Vortex Flowmeter innovation. 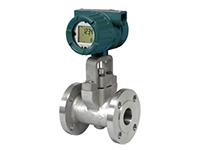 Vortex Flow Meters use the Von Karman Effect to measure the rate of flow of a fluid or gas. What is the Von Karman Effect? Early in the 20th century, a Hungarian-American mathematician and physicist, Theodore von Karman, discovered that a fluid or gas flowing perpendicularly pass a bluff body would generate alternating vortices on both sides of the body. The path of these vortices is called the Von Karman Street. From the equation, we can see that the frequency is proportional to the velocity. If we can measure the frequency (f), know the Strouhal number (St), know the shedder bar width (d); we can solve for v (velocity). How do we measure the frequency of the vortices? As vortices form and pass the shedder bar (the bluff body), they create a low pressure as compared to the rest of the fluid. This low pressure produces a differential pressure (dp) across the shedder bar. The high pressure side of the dp exerts stress on the shedder bar in the direction of the low pressure. As the location of the low pressure side alternates due to the vortices switching from side-to-side, the change in direction of the exerted force causes the shedder bar to oscillate. This oscillation is equal to the Karmen Vortex Frequency. There are several methods in the marketplace to measure the oscillation. Diaphragms or capacitance sensors are two of the more common; but, the best method is the use of Piezo-electric crystal sensors. These sensors, when compressed, produce an electric signal that can be sent to the Flow meter's electronics. Now that the Karmen Vortex Frequency is measured (and we know the St and d), the flow meter electronics can do simple calculations to determine volumetric flow through the pipe. 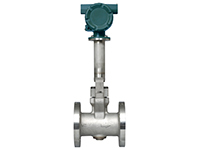 What are the advantages of using Vortex Flow Meters? The accuracy of the vortex flow meter is ±1% (pulse output) of the indicated value for both liquids and gases and is higher compared to orifice flow meters. For liquids, an accuracy of ±0.75% is available depending on the fluid type and their conditions. Rangeability is defined as the ratio of maximum value to minimum value of the measureable range. It is braod rangeability the allows vortex flow meters to operate in processes where the measuring point may fluctuate greatly. Since the output is directly proportional to the flow rate (flow velocity), no square root calculation is needed, while orifice flow meters require square root calculations. Since frequency is poutput from the sensor, zero-point shift does not occur. Since only the vortex shedder is placed in the pipe of the vortex flow meter, the fluid pressure loss due to the small restriction in the flow piping is small compared with flow meter a having an orifice plate.